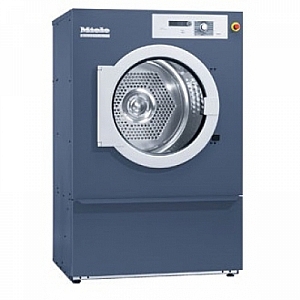 Miele PT8403 16-20KG Dryer from Gillmans Commercial Appliances. * Air recycling: by using the axial airflow principle approx. 60% of the warm air from the drying cycle is recirculated to ensure optimum energy consumption and drying times. * Electronic moisture monitoring with Miele`s patented Perfect Dry system. * Large intelligently placed Softlift drum ribs ensure optimum laundry tumble and thus excellent drying results.